Critiques Archives - Art Matters! The Southern Oregon Society of Artists ( SOSA) April 23, 2018 meeting is a Juried Critique at 7 PM at the Medford Public Library. Public is welcome but only members may bring art to be adjudicated. Artwork to be evaluated must be there by 6:30 pm Snacks will be available. Our Judge will be Catie Faryl. The Southern Oregon Society of Artists ( SOSA) September 25 meeting takes place at the Medford Public Library at 7 pm and will be a “Work in Progress” Critique. Barbara Burnett will be advising members on their active works. Guests are always welcome and, if time allows, their works will be looked at as well. For more information call BJ Mathis at 541-414-4993 or Judy Grillo at 541-625-3285. SOSA January 2017 Meeting – The Southern Oregon Society of Artists (SOSA) will start the 2017 Season on January 23, at 6:30 pm at the Medford Public Library. The SOSA January 2017 Meeting opening program is a Membership Art Critique with Kim Hearon, Executive Director of the Rogue Gallery & Art Center, acting as Juror. Also at the SOSA January 2017 Meeting, the President’s Challenge will be B&W drawings, no bigger than 8×10 and hopefully incorporating “SOSA” and “2017” but not required. The winner will be used for the 2017 Directory/yearbook cover. The Southern Oregon Society of Artists (SOSA) October meeting will be the group’s last regular season meeting of 2016. The meeting takes place on October 24, 2016 at the Medford Public Library at 6:30 pm. This is a critique meeting, which means all members are welcome to bring their completed, gallery-ready works to be critiqued by guest artist Lucy Warnick. Non-members are welcome to come and observe. The meeting starts at 6:30 with refreshments and social time. Then the critique starts at 7 pm. Lucy Warnick was born in the Chicago area and began her art education at the University of Illinois before moving to the northwest. While studying at Oregon State University under Nelson Sandgren, Warnick was introduced to painting outdoors, which is still the foundation of her work. Lucy received a BFA in painting from the University of Oregon in 1974. She has worked as a teacher and arts administrator in Southern Oregon and Houston, Texas, as well as exhibiting her work throughout the country. Nature is the source of inspiration for Lucy’s paintings and prints. 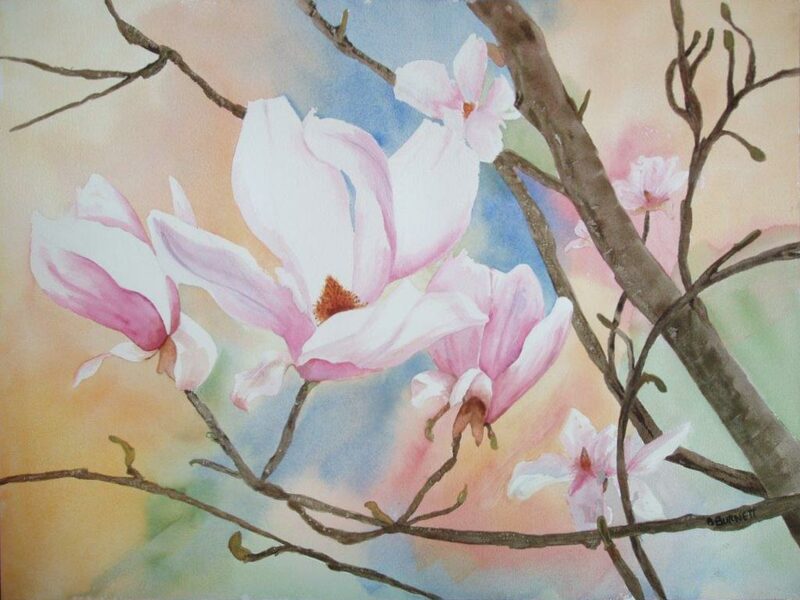 She paints outdoors year-round as well as working from models and painting still life. Lucy’s work is currently on display in the showroom of Cabinet Solutions at 315 N. Bartlett in Medford. For more information please call Judy Grillo at (661 )609-5837 or BJ Mathis at (541) 414-492. The Southern Oregon Society of Artists (SOSA) holds its regular monthly meeting at the Medford Public Library on September 26, 2016 at 6:30 pm for a work-in-progress critique, refreshments and in-person social networking. Meeting / Critique starts at 7. All members are encouraged to bring in a work-in-progress. This month is our SOSA Work-in-Progress Critique by Dixie Kinser. Members are encouraged to bring their work early. Dixie first became enamored with art by dyeing silk. She loved to see how colors bloomed into beautiful patterns. In the 90s, she began another romance, this time with watercolor. Again, colors blended with beautiful results. Since then she loves experimenting with color, shapes, composition and values. Then she just had to try abstract. At present, her work is primarily abstract and mixed media collage using watercolor and acrylic. For most of her career, Dixie worked in education as an administrator and teacher; however she finds art even more fulfilling. Southern Oregon Society of Artists meets the fourth Monday of each month – January through October – at the Jackson County Library at 7:00 p.m. The library doors are locked at 7 p.m., so come early. Members may submit 1-2 paintings for the January, April, July, and October juried critique at the regular meetings. The other meetings will feature demonstrations from local artists. For the latest updates check out www.sosa-inc.org/. The Southern Oregon Society of Artists July Meeting will be held July 25 at the Medford Public Library starting at 6:30 pm. This is our Membership Art Critique and all members are invited to bring a piece of their own work for a professional evaluation and critique. The Artist critiquing will be Alx Fox. You must have your work there by 6:30 to participate. All works submitted must be original. This month’s meeting of the Southern Oregon Society of Artists will take place on April 25th at 6:30 at the Medford Public Library. This month’s meeting features our quarterly Juried Critiques, judged this time by Linda H. Snodgrass. Registration and refreshments at 6:30, Program starts at 7 pm. Artists of all levels are welcome to come, learn and enjoy!